Stay connected in style with the 42mm GPS and cellular-equipped Apple Watch Series 3, which comes with a silver anodized aluminum chassis and a Seashell Sport Loop. Designed for users looking for the next generation of connectivity, Apple's Watch moves your iPhone's apps and functions to your wrist, so you can do more while leaving your phone in your pocket. Apple Watch connects to your iPhone via Bluetooth 4.2 and displays notifications, apps, and more on its 1.5" display. It can also connect directly to the Internet thanks to 3G and 4G LTE cellular compatibility and 802.11b/g/n Wi-Fi. The internal battery lasts for up to 18 hours of normal use and is recharged with an included inductive magnetic charger. Note: PLEASE NOTE: Requires service plan to activate. Not compatible with all wireless networks in all countries. May result in additional charges to your wireless bill. The cellular-equipped Watch Series 3 uses its screen as an antenna, connecting you to wireless networks without the aid of your iPhone. Leave your iPhone in the car, at home, or in your gym locker and stay connected, with 4G LTE to keep notifications rolling in from your favorite apps. Your phone number carries over so you don't have to give out a new number to receive calls and text messages from your contacts. Built-in GPS lets you navigate and get accurate workout data — no phone required. It connects quickly to GPS satellites and records distance, speed, and pace for your workout as well as the route you traveled and whether you're walking, running, or cycling. The Activity app displays progress made towards your daily activity goals with three intuitive rings that grow the more you move, finally closing when you hit your targets. The Stand ring shows how often you've stood up to take a break from sitting, the Move ring shows how many active calories you've burned, and the Exercise ring shows how many minutes of brisk activity you've completed. Swipe up from the bottom of the Watch to view active calories burned, steps taken, and distance traveled. You can also compete against friends and family and respond to notifications of their progress. With more than 12 indoor and outdoor workouts to choose from, including lap and open-water swimming, biking, running, and elliptical, it's easy to stay fit. The Watch learns swimmers' strokes automatically, and wheelchair users can take advantage of chair-specific workouts with a variety of pushing techniques. A barometric altimeter logs stairs climbed and helps runners, cyclists, skiers, and snowboarders on their routes. There's also high-intensity interval training for people who want to push even harder. Switch between back-to-back workouts and see a comprehensive summary of your results. Your Watch senses your activity on its own, so there's no need to enter it in manually. Goals can be adjusted manually or based on weekly suggestions from the Activity app. Third-party app support lets you interact with favorite fitness apps directly on your Watch, taking advantage of its heart rate sensor and motion sensors. 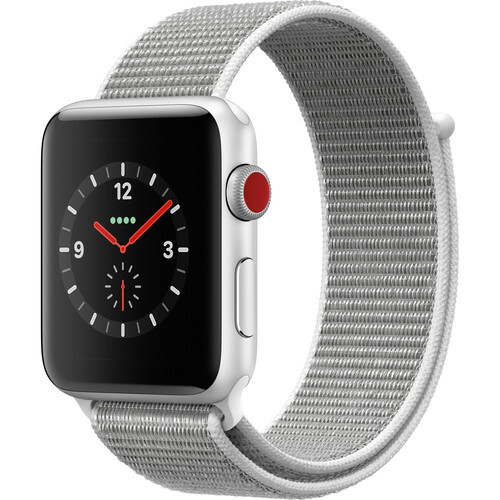 Box Dimensions (LxWxH) 5.75 x 5.75 x 3.4"
Watch Series 3 42mm Smartwatch (GPS + Cellular, Silver Aluminum Case, Seashell Sport Loop) is rated 4.0 out of 5 by 9. Rated 1 out of 5 by Marco from DO NOT BUY THE DISCOUNTED APPLE WATCH FROM B&H A few days ago B&H started selling discounted priced Apple Watches, generation 3. When the Apple Watch arrived it didnt respond to touch controls, so I had to reset it a couple of times, I thought that would be fine. After two days of use, the screen sank into its face breaking the edges of the watch. I dont remember banging the watch at any point, and B&H refuses to make the return claiming I was at fault. I have a generation 2 Apple Watch that has been working flawlessly since day one, that Apple Watch I bought from the Apple store, I have dropped, banged against doors and walls, never has that watch cracked a single time. If youre buying from B&H be careful and at least return it with the slightest sign that the item isnt responding how it should. Customer service from B&H has been awful too, they dont even want to listen to my claim. Rated 5 out of 5 by Terry from Never knew I needed this watch. ?Now we're inseparable! I initially got the Apple Watch to help monitor my heart rate and activity throughout the day. ?After a day or two of wearing it, I found myself not wanting to take it off. ?I love nice watches and tend to alternate between a few depending on what I'm doing, so I held off purchasing this one since it didn't look like the chronographs I favor. ? I really wasn't sure if I would wear it often enough. ?Boy, was I wrong! I really love being able to easily change the watch face to suit my ever changing mood, and it's become an invaluable assistant to my daily life. ?I can take or make calls, check my schedule, map out my drive, check the weather and use Siri, all without picking up my phone. ?I really can't recommend this watch enough! The Apple bands are nice but are crazy expensive, so just buy some cheap ones on Amazon. ?They're very easy to switch out. ?My watch came with the Sport Loop band, which is super comfortable, but it's very casual. ?I chose the silver case since it's a bit dressier and goes well with so many band styles. Don't hesitate. ?Just go for it! Rated 5 out of 5 by Martha from If you love Apple products, you will absolutely love Apple W If you love Apple products like myself, all your?expectations?and more will be meet! love it. Rated 5 out of 5 by Tracy from Upgrade from Apple Watch 1 I am still getting use to all the new features but I love it. I selected the 3 series because of price and old watch band would still fix. The price was great, I got a free extra watch band and donate the other watch to my Mom. The service from B&H was excellent and quick. Rated 1 out of 5 by Mara from Doesn’t say it’s the A1861 I’m really upset as I bought this Apple Watch to use in Brazil and no where in the add it says that it’s the model A1861, witch does NOT work with the Brazil carriers. Now I’m in Brazil and Dont know what to do with this watch! Rated 4 out of 5 by Dean from I like it but... the wrist band was not as expected, otherwise it works as it should. Rated 5 out of 5 by James from Apple Watch Thanks, the watch is great and my wife loves it. Is it a last model of 3 series? This is the current version of Series 3 MQK52LL/A. This watch is new in a box not used or refurbished. All items on our site are new unless specifically marked as used, with a condition rating. You will also notice the &quot;Used&quot; tab highlighted at the top of our page. This would work with Airtel and Jio as carriers in India. Will this watch work with verizon? Is it compatible with Telcel in Mexico ?